With strategies for health and wellness more popular than ever, people are looking into the benefits of swimming from home for fitness. Aquatic exercise has many terrific advantages. Here are just a few great health benefits from using a swim spa. Total Body Rejuvenation – Hydrotherapy, or the combination of heat, massage and buoyancy, alleviates pain and reduces stress. When muscles and joints are stiff, sitting in the hot tub end of a swim spa delivers targeted massage for soothing relief. With regular use, a swim spa can rejuvenate the entire body. Recovery and Rehabilitation – After suffering an injury, or for on-going medical treatment, a swim spa is the ideal at home recovery or rehabilitation treatment. Whether you’re looking to improve mobility or recover from surgery, therapy in water is a smart way to promote quick healing. Easy Senior Fitness – With a swim spa at home, seniors can engage in safe, convenient cardiovascular conditioning, strength training and more from the comfort and privacy of home. And, with a variety of fitness accessories, like under water treadmills, resistance bands and more, a swim spa offers a great workout in a supportive environment. To learn more about the benefits of owning a swim spa, pick up a copy of our free buyer’s guide, Secrets to Swim Spa Buying Success. 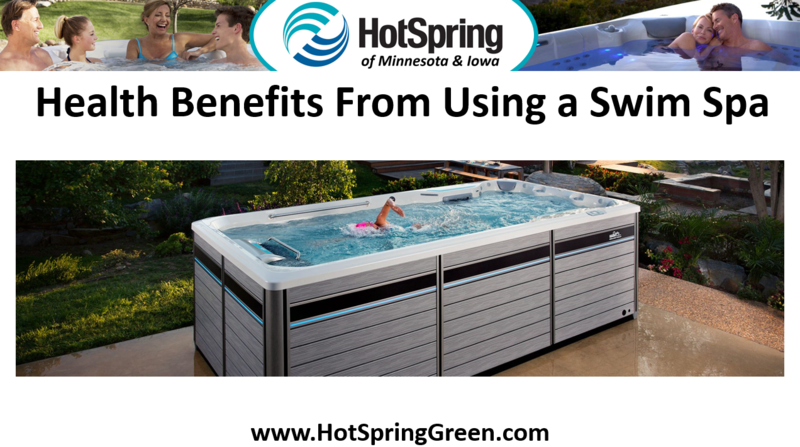 Just give us a call at ☎ 763-450-5310 or visit our website at: https://hotspringgreen.com/swim-spas. I like how you talked about how the combination of heat, massage, and buoyancy alleviates pain and reduces stress. That is something that I don’t think I would have known about swim spas! I am glad that I read that so I can factor that into my decision on if I want to get a swim spa or not for my backyard!